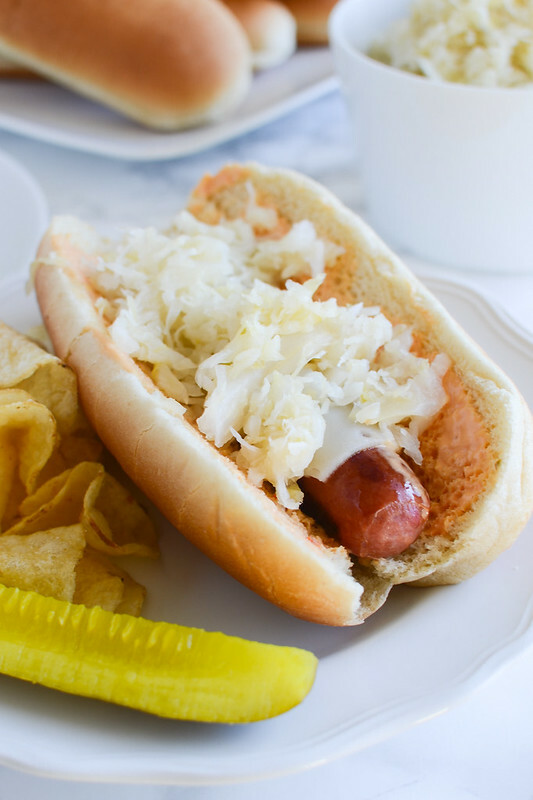 This recipe is inspired by my weird obsession with sauerkraut. You guys, I can’t stop. I don’t even want to tell you how much I go through in a week. Yep, straight from the package. It’s a problem. I picked up some Johnsonville Beef Brats recently in preparation of the big game. 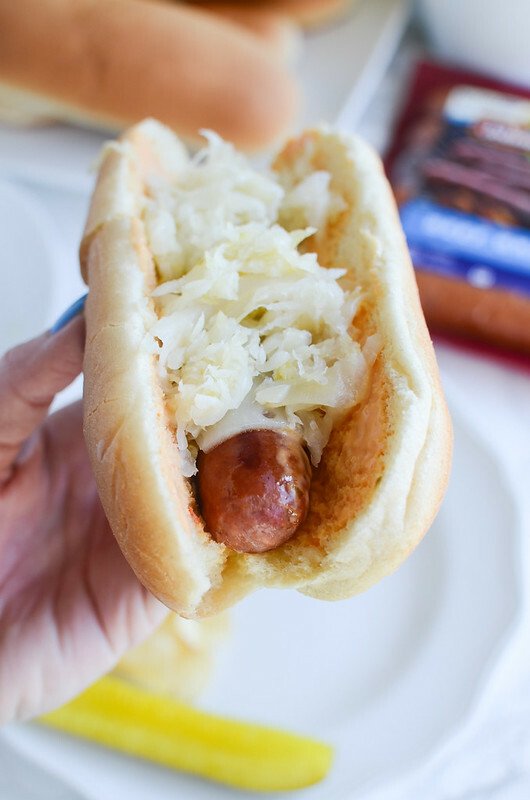 These brats are my go to because they’re fully cooked, perfectly spiced, and so delicious. I really wanted to come up with a unique way to serve them and, of course, my first thought was sauerkraut. Are you a reuben fan? I think that’s where my sauerkraut obsession started. I’ve been obsessed with those sandwiches for as long as I can remember and sometimes I can go an entire week eating nothing but reubens for every meal. Yep, for breakfast. I have no shame. Anyway, so like the classic sandwich these Reuben Brats have thousand island dressing generously spread on the bun and then a slice of Swiss cheese melted on top while they are still hot and then they’re topped with a good helping of sauerkraut. So good. My new obsession. I may be going back to the store before the big game to buy everything again because I don’t think I’ll have any left by then! 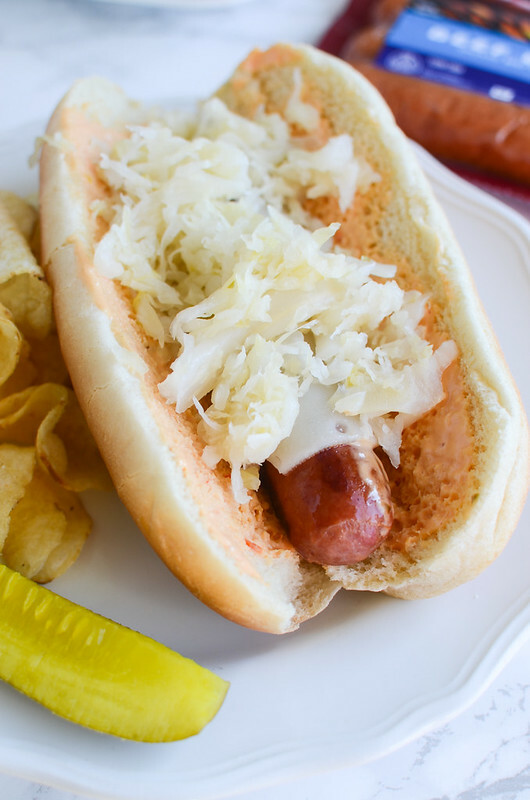 If you are entertaining for the big game, these Reuben Brats would be perfect. You could put a couple packs of the Johnsonville Beef Brats on the grill and people could dress their brats as they please. 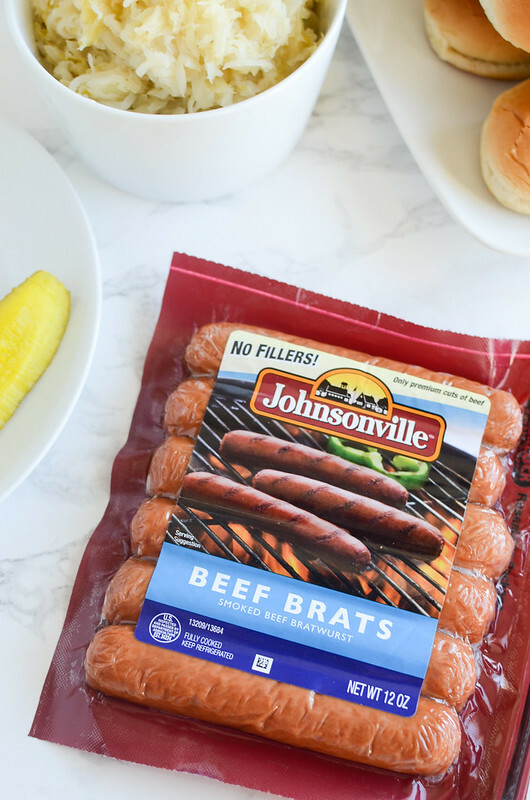 Johnsonville is the number one sausage brand in the US and they believe that bringing family and friends around the dinner table shouldn’t involve complicated meal prep. And that’s why I love all their products. Especially the fully cooked sausages – they make dinner prep really quick and really easy! Let me know in the comments if you plan on spicing up your game day with some Johnsonville sausage! If you’re interested in finding out more about Johnsonville or want some yummy recipes ideas, visit their Facebook or Pinterest pages! Cook brats over medium-high heat until browned and heated through, about 5 minutes. Spread each buns with Thousand Island dressing. Place a hot brat on each bun and immediately top with a slice of Swiss cheese. Put 1/4 cup of drained sauerkraut on top. 3 Responses to "Reuben Brats"
love love love!!! 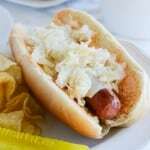 Sauerkraut and brats are HUGE here in Wisconsin. . like, eating these is a way of life. . this reuben brat looks amazing!!! !